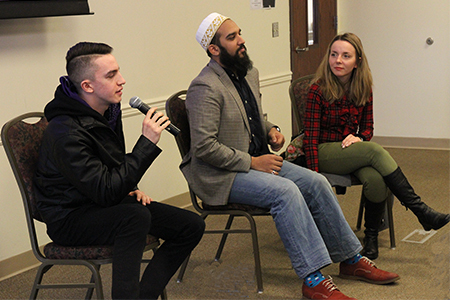 From left, American Honors alumni Alex Ivanoff, Murtaza Khomusi and Arina Balako speak about their experiences at their transfer schools. Current American Honors students gather with program alumni following the symposium. 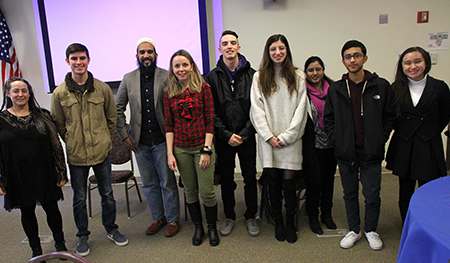 From left are Professor of English Carol Bork, current student Dan Hurley, alumni Murtaza Khomusi, Arina Balako and Alex Ivanoff, and current students Alexandra Morrow, Saniya Saleem, Jason Lima and Colleen Lim. 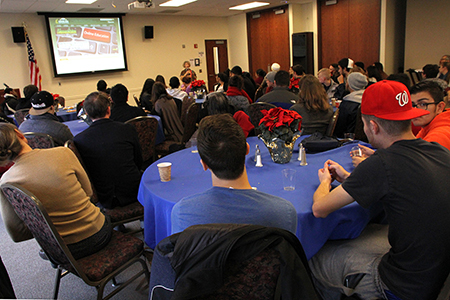 Professor of Sociology Ginna Durso-Finley (at the microphone) served as MC at the symposium. The atrium was filled with projects including a poster presentation entitled "Fermentation: The Making of a Symbiotic Culture of Bacteria and Yeast" by students in Honors Biology 101. 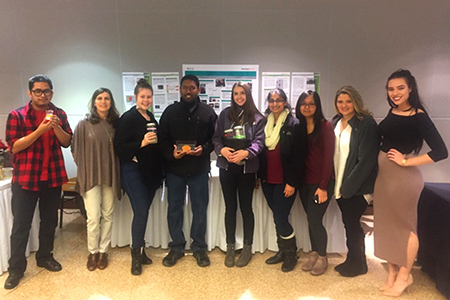 From left are Luis Garcia, Professor of Biology Laura Blinderman, Kayla Gray, Michael Sammy, Samantha Mayernik, Anum Paroya, Carmella Ingles, Brianna Deblois and Tabitha Rutkowski. West Windsor, N.J. – The American Honors (AH) at Mercer program ended its semester on a stimulating note Dec. 16 as students presented projects and research findings from a semester’s worth of work. The event, which was held in the MCCC Conference Center, drew both freshman and sophomore students, as well as professors and AH advisors. For the first time, the symposium featured three AH alumni, who returned to campus to participate in a panel discussion: Arina Balako ’16 (A.A., Liberal Arts), currently a junior at Columbia University studying mathematics and statistics; Alex Ivanoff ’16 (A.S., Business Administration), a Sports Management major at New York University (NYU) focused on sports law; and Murtaza Khomusi ’14 (A.S., Biology), a pre-med student at Swarthmore College focusing on Islamic Studies, and minoring in Biology and Interpretation Theory. All three say that Mercer prepared them well for their transfer schools and credit their AH advisors and professors with helping to open them up to the possibilities and providing guidance on selecting schools that were the best fit. Khomusi remembers his time at Mercer fondly. “I really loved the atmosphere here,” he said. He recalled that he didn’t even know what a Liberal Arts college was until he went on an American Honors trip to Swarthmore. He is very happy that he decided to go there. The American Honors curriculum, which focuses heavily on critical thinking and close reading of material, earned high praise from the alumni. Khomusi recalls initially feeling insecure about how he would match up at Swarthmore. “There was a definite increase in the workload – especially the required reading – but I had learned how to be a close reader at Mercer so I was up to the challenge." The three suggested that current students make the most of the opportunities available to them at Mercer. “Get experience to build your resume. Do community service here. Make connections with professors and fellow students,” Khomusi advised. Khomusi added that students often look for a formula for success. “There is no one formula for a successful person. I have met such different people who are successful in their own way. Be yourself and do your best to achieve your particular goals. Nobody does 'you' better than you,” he said.